Reed for Bb Boehm Clarinets Strength: 2.5, Light response, Optimal vibration behavior, Easy to control in all registers, Long durability, Made from the best French reeds, Pesticide-free cultivation guaranteed, Minimal production tolerances, Made in Germany!, Package includes 10 reeds! 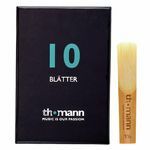 Reed for Bb Boehm Clarinets Strength: 3, Light response, Optimal vibration behavior, Easy to control in all registers, Long durability, Made from the best French reeds, Pesticide-free cultivation guaranteed, Minimal production tolerances, Made in Germany!, Package includes 10 reeds! 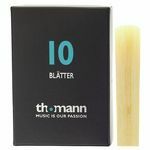 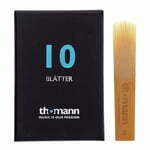 Reed for Bb Boehm Clarinets Strength: 2, Light response, Optimal vibration behavior, Easy to control in all registers, Long durability, Made from the best French reeds, Pesticide-free cultivation guaranteed, Minimal production tolerances, Made in Germany!, Package includes 10 reeds! Reed for Bb Boehm Clarinets Strength: 3.5, Light response, Optimal vibration behavior, Easy to control in all registers, Long durability, Made from the best French reeds, Pesticide-free cultivation guaranteed, Minimal production tolerances, Made in Germany!, Package includes 10 reeds! 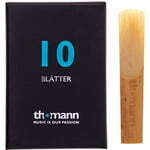 Reed for Bb Boehm Clarinets Strength: 1.5, Light response, Optimal vibration behavior, Easy to control in all registers, Long durability, Made from the best French reeds, Pesticide-free cultivation guaranteed, Minimal production tolerances, Made in Germany!, Package includes 10 reeds! 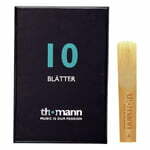 Reed for Bb Boehm Clarinets Strength: 4, Light response, Optimal vibration behavior, Easy to control in all registers, Long durability, Made from the best French reeds, Pesticide-free cultivation guaranteed, Minimal production tolerances, Made in Germany!, Package includes 10 reeds!